Sixth round pick Mitchel tore his labrum during training camps and lost his rookie season. The team hoped to have him clear waivers before placing him on injured reserve, but the Colts sniped him away. Spencer was waived/injured during final roster cuts before the start of the regular season, but the team later released the former Buckeyes receiver with an injury settlement on Sept. 9. Spencer was signed to the Tampa Bay Buccaneers practice squad a couple of weeks later and was promoted to the active roster in late-December, as the Bucs hope to ensure his spot in the franchise for next season. Like Spencer, seventh round pick Reiter was waived before the start of the regular season, but was signed to the Redskins practice squad a few weeks later, where he stayed for the rest of the regular season. Reiter was not thought of highly enough to backup Josh LeRibeus at the center position when Kory Lichtensiteiger was placed on injured reserve-designated to return. 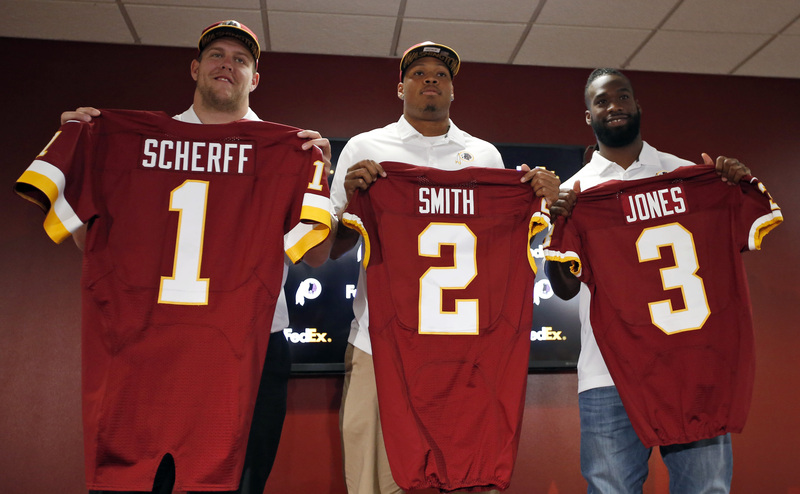 The draft picks who stayed on the roster include G Brandon Scherff, OLB Preston Smith, RB Matt Jones, WR Jamison Crowder, G Arie Kouandjio, MLB Martrell Spaight, and DB Kyshoen Jarrett. The leading tackler in the SEC last year, Spaight played in just the season opener for Washington this season, as his rookie year was cut short by a concussion so severe that it was season-ending. With three middle linebackers pending free agency, Spaight could see a significant increase in action during the offseason — if healthy enough to continue. DeMatha product Arie Kouandjio played in four games this season at left guard in limited opportunity. Once expected to overtake the position from second-year man Spencer Long after the season-ending injury to Shawn Lauvao, Kouandjio will continue to be a developmental project. Kouandjio is limited when on the move, but his physicality and aggression in the run game is probably what drew McCloughan’s interest. Now we can to the meat of the discussion by analyzing the play of those who got their fair share of action in the regular and post-season. As the fifth overall pick, you might think drafting a guard was a bust. However, Scherff has been a major upgrade over last season’s veteran Chris Chester at the right guard position and has shown a great motor. Scherff’s athleticism has also been on display on the Redskins limited screen game, as you can find him 20 yards downfield leading the way. Scherff is far from a finished product as there are the occasional lapses where he is beaten badly, but under the tutelage of offensive line guru Bill Callahan, the former Iowa Hawkeye has a bright future. Scherff helped the Redskins go from allowing 58 sacks in 2014, second worst in the league, to just 27 in 2015, fourth best in the league. Probably the best available statistic on the rookie lineman is that he only committed three penalties, two holding (one of which was offsetting) and one false start, while playing every offensive snap except one when his cleat fell off. Preston Smith was a possible first round talent that fell into Washington’s hands in the second. Although not given much of an opportunity in the first half of the season because of Trent Murphy, the Mississippi State product finished off the season strong. His three sack performance against the Eagles helped lock the NFC East, while he also had a safety against the Green Bay Packers to open up the scoring in the wildcard game. Including the playoffs, Smith finished with nine sacks (six in the last four games), 33 tackles, three forced fumbles, and four pass deflections. With another year of learning the system and work in the weight room, Smith will likely be a starting caliber pass rusher, sooner rather than later. With Junior Galette likely to re-sign, Smith might not get an extended opportunity to show off his rushing ability. Matt Jones was the early candidate for rookie of the year, for the Redskins franchise, by bursting on the scene with physical down hill running. The Florida Gator finished with 490 rushing yards (but just 3.4 yards/attempt), 304 receiving yards, and four total touchdowns in 13 games of play. The only thing that kept Jones from completely overtaking Alfred Morris as the lead back were four lost fumbles, good for second-most in the league among running backs. Nonetheless, the ball security issue can be fixed, and with another year in Bill Callahan’s power running game, Jones could become a serviceable back for the Redskins for years to come. When Jamison Crowder first came into training camp, he quickly overtook Andre Roberts for the starting slot receiver position. The rookie out of Duke broke the Redskins rookie record for most receptions in a season with 59, and also finished with 604 yards and two touchdowns. Crowder’s quickness allows him to be a useful tool in the intermediate game as well as on screen plays. The one downside has been the fact that he did not thrive in the punt returning role that many were hoping for, averaging just over five yards per return. Although McCloughan passed up a chance to grab former Terps playmaker Stefon Diggs — arguably the biggest steal in the draft as a fifth round pick — Crowder has already had a solid return as a fourth-round selection. Probably the biggest steal for McCloughan’s first draft is Virginia Tech Hokie Kyshoen Jarrett. Originally drafted to be a safety, Jarrett’s versatility allowed a smooth transition to nickel corner when the Redskins simply did not have enough bodies to keep up. The sixth round pick was a solid cover man and recorded 57 tackles, as well as four passes defended. With the emergence of Quinton Dunbar to team up with Chris Culliver and Bashaud Breeland, Jarrett could transition back to his natural safety position, where he can get back to laying the wood on receivers over the middle of the field. Relative to the value of their draft pick, I believe Scherff, Smith, Jones, and Crowder deserve B’s on their report card because they have all performed well with occasional lapses in execution. Jarrett, on the other hand, deserves an A because he has already shown himself serviceable as the fifth defensive back on the field as a mere sixth round pick. With the right coaching staff in place with experienced assistance, as the Redskins do, McCloughan’s hand-picked talent has the potential to develop into good NFL caliber starters. Expect McCloughan to continue reshaping the Washington Redskins roster through the draft instead of flashy free agent signings that got the Burgundy and Gold in trouble in the past.